Mild symptoms for conjunctivitis allergy include itching, redness and watery discharge from the eye. Severe symptoms include aggravated itching, eye pain, puffiness, crusty eyelids and photophobia (sensitivity to light). While a general practitioner can diagnose and treat mild symptoms, it's best to consult an ophthalmologist for severe symptoms. 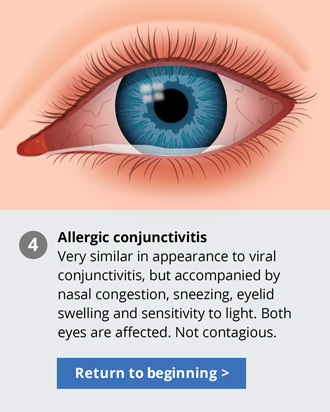 There are different types of allergy associated conjunctivitis out of which seasonal and perennial variations are more common and benign. Conditions such as vernal keratoconjunctivitis, atopic keratoconjunctivitis and giant papillary conjunctivitis are rare but more harmful. For diagnosis, your doctor will take into consideration several factors such as the physical condition of your eyes, family medical history, allergy history and individual symptoms. He or she may recommend a skin prick test or a blood test for accurate diagnosis and identification of allergen. Treatment may include one or a combination of ocular medications such as decongestant eye drops, lubricating eye drops, anti-inflammatory eye drops and anti-histamine eye drops. In severe cases, steroid eye-drops may be prescribed which should only be taken under a doctor's supervision. Oral medications may be prescribed in aggravated conditions. As distressing as itchy eyes are, avoid rubbing your eyes as this can worsen your condition. For relief, apply a cool compress to your eyes. Use a saline serum as this helps lubricate eyes and removes allergen particles from the eyes. Keep your eye drop medications in the fridge – you will experience quicker relief from symptoms when you use them. For very complicated cases, an ophthalmologist may recommend surgery but most people don't need it. By following the above strategies with determination and resolution, you can experience significant relief and reduction in symptoms!